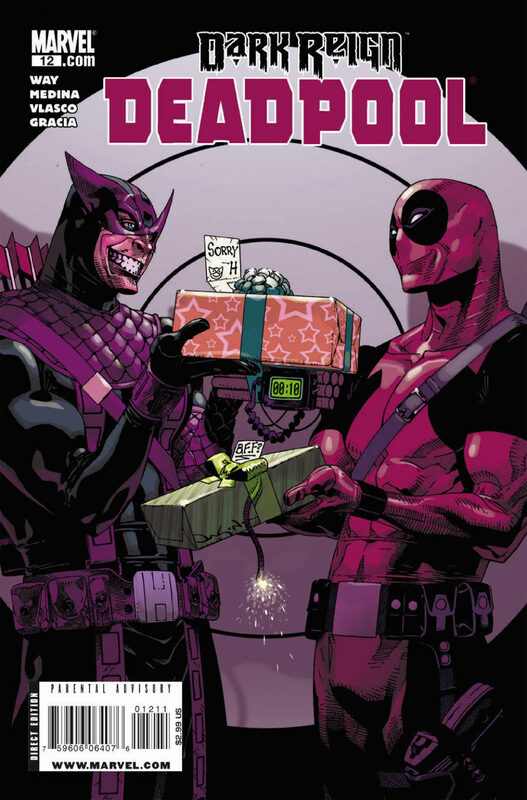 Okay, so there is no meat suit or arrow through the head, but this wrap up of the Bullseye vs Deadpool story ends as it began – quirky, funny, immediately forgettable. And as I said before when I reviewed Deadpool, the immediacy and throwaway nature of the title is not a bad thing. The resolution to the battle between the 2 killers ends logically (Marvel are not going to be killing off either of their more charismatic characters after all) but that is when things get weird, as the ending is surprisingly downbeat. In fact, you would reasonably assume that Deadpool #12 was the final issue in the series – but as Deadpool is rapidly becoming a franchise to match the likes of Wolverine, that is not going to be happening any time soon. Still, it was a bit jarring considering the humour and relative frivolity that had gone before it. There is a 4×4 versus Missile scene, a lock-up full of deadly weaponry that Deadpool treats like some men treat their Garden Sheds and Deadpools love of Tacos and Potato Chips. See? He is just a regular guy…….